March has had outstanding weather besides the few days of wind we experienced the first couple of days of the month. 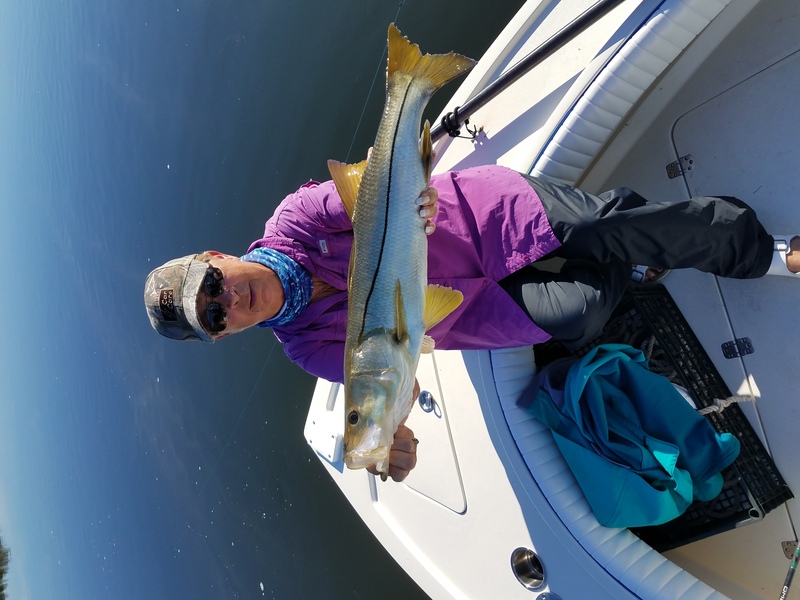 Snook have been the main target, but redfish, and trout were still caught on most trips this month. April is halfway booked, so if you want to get out call now.Snook fishing has been great with the warm weather and plenty of bait as of lately. 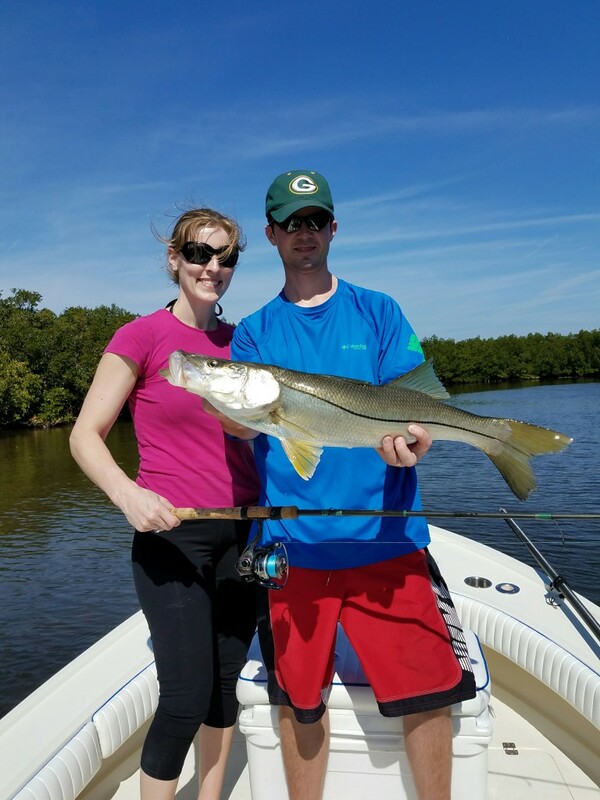 Most of the Snook have been 22″-26″ and there is a good abundance of them in the Tampa Bay area. 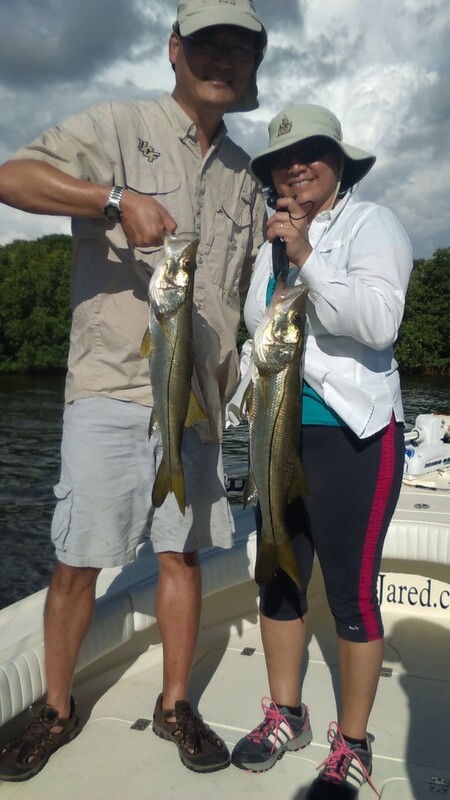 We are also catching a few slot Snook as well. 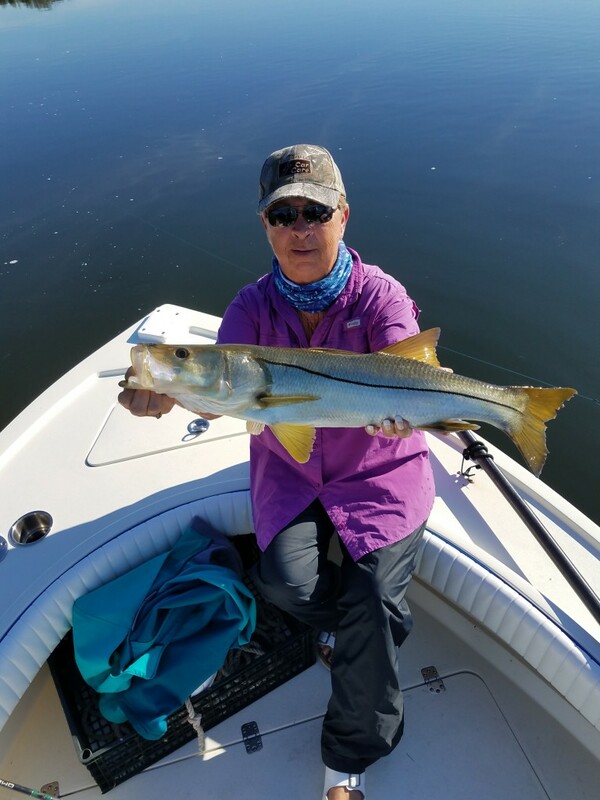 The slot limit in the Tampa Bay area is 28″-33″ with 1 per angler, abs we try and limit are Snook to 1 per boat. 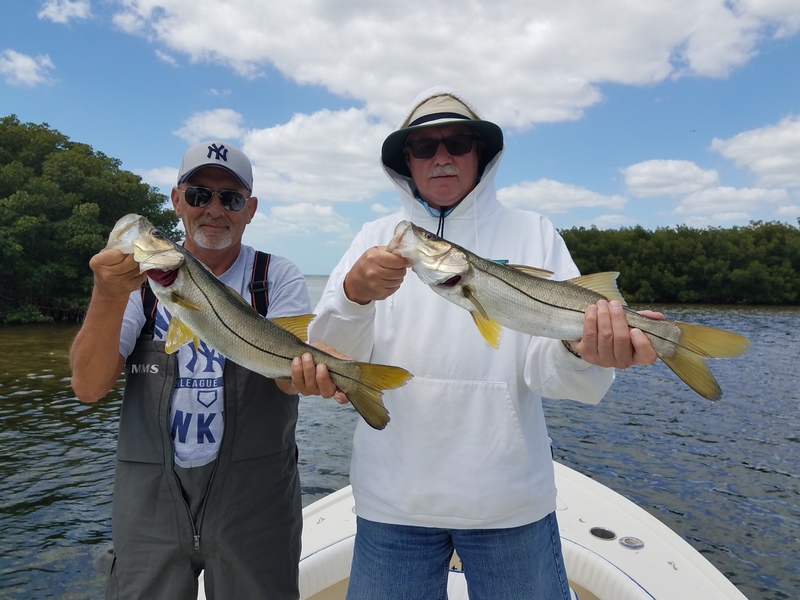 Snook are also starting to move in the Clearwater Beach area, and will be stacked up on the beaches in just a few short weeks. If you want to catch Snook now is the time! 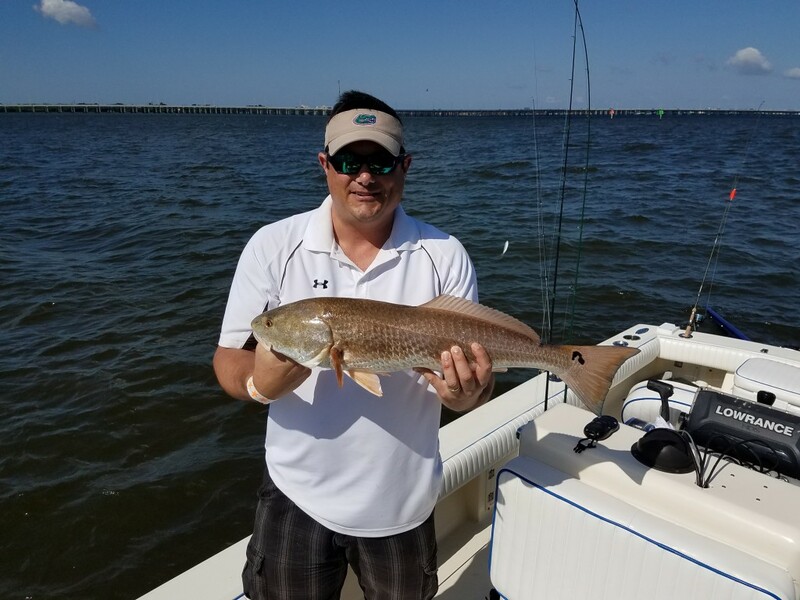 Redfish have been around and we are catching all sizes right now, and they are eating everything shrimp, dead bait, live bait, artificial. 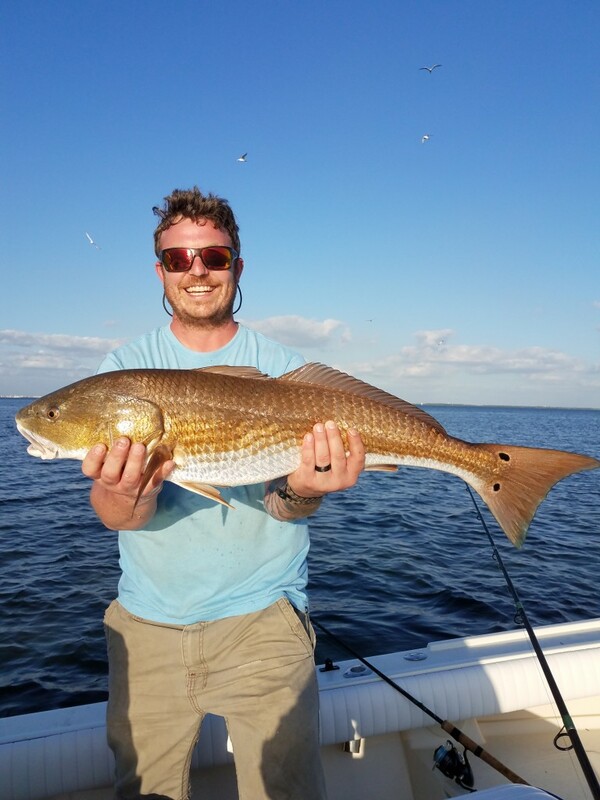 Tides have been crucial to our success and we have been catching some big reds over the slot in the low 30″ range. 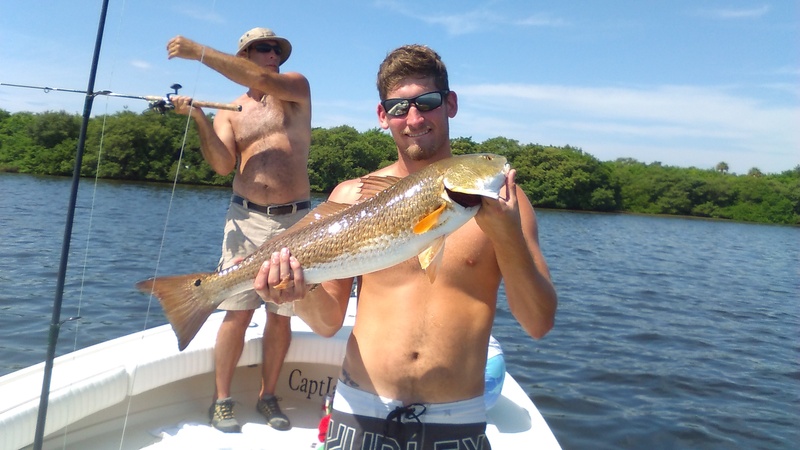 Redfish will be abundant throughout Pinellas county waters for the next couple of months. Trout have still been biting good and catching limits for the dinner table haven’t been a problem on 95% of trips lately. With the warmer Temps coming the trout are starting to thin out in the areas we are targeting right now. Black drum have also made an appearance and we have caught a few this month using jigs. Triple tail are also around if you keep and eye out while running you may see one. Tarpon season is just around the corner and we will start to fish for tarpon in the next few weeks. May, June, July are prime tarpon season and we will only be fishing one trip a day, or one at night. Please get with me for more information. Kids Fishing Trips over Spring Break 2017!!! 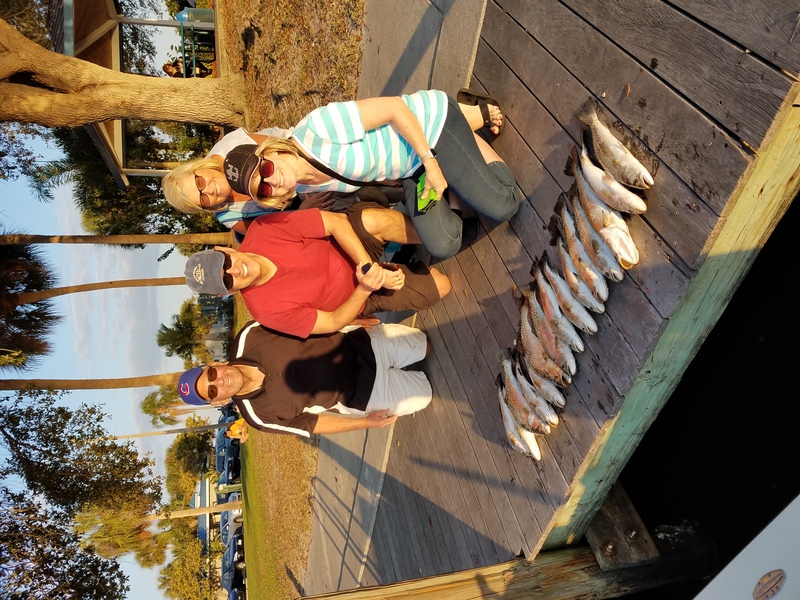 Fishing Charters in both Clearwater beach and in Tampa Bay have been highly productive as Spring has arrived. Air Temps have been in the high 70’s and and water temp has been in the high 60’s and fast approaching the 70’s perfect for fishing and beach days! The last 2 weeks have been Trout, Snook, and Redfish for my charter trips. Trout fishing season is winding down, but for anglers looking to keep some fish for dinner we have been catching limits of trout before moving on to other species. Live bait and Artificial lures are both working. 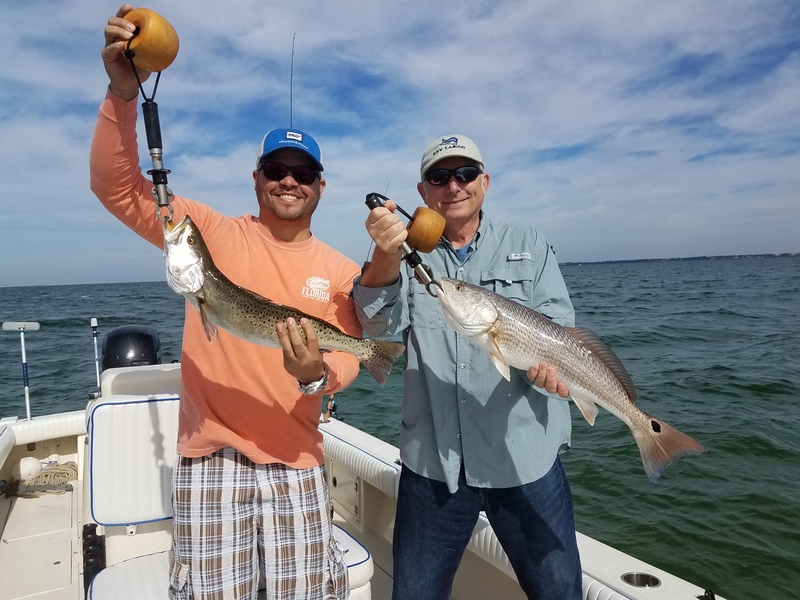 Trout will remain around in the area, but we will start focusing on more snook and redfish in Clearwater/Tampa area during March and April. 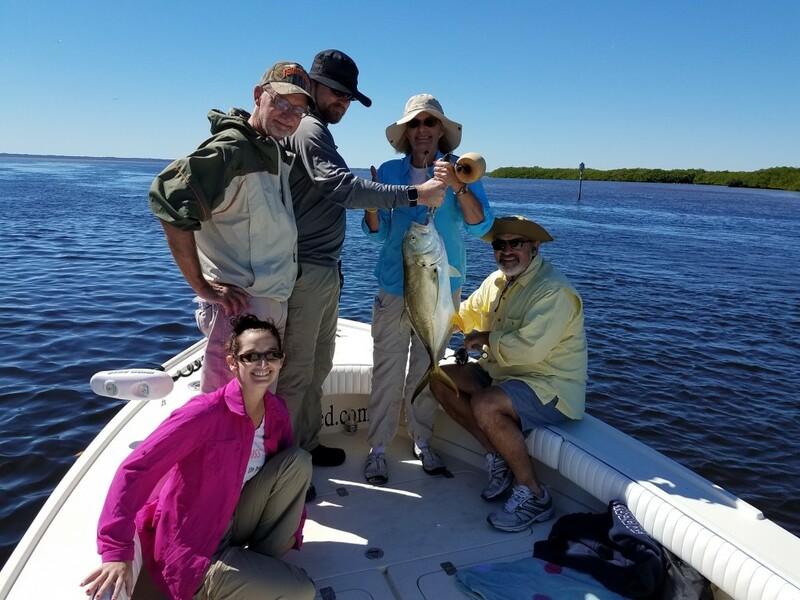 Snook fishing is starting to turn really good in Tampa bay and the fish are starting to move out of the back waters and are ready to feed! Snook are like bass on Steroids and they put up an awesome fight. Most of the fish over the last two weeks have been in the mid 20″ range, and some bigger fish should be showing up any day. Redfish have flooded the Clearwater beach area, and are also abundant in the St.Pete beach and in Tampa bay. Redfish are bulldogs of fishing and the fight is second to none! These shallow water game fish are awesome to target when they are schooled up and feeding heavy. Fishing for reds does take some patience as the fish are in shallow water and are often spooky, but once located and fished probably the results are awesome! Redfish bite will remain good till October. Give me a call if you want to get out and do some fishing!!! 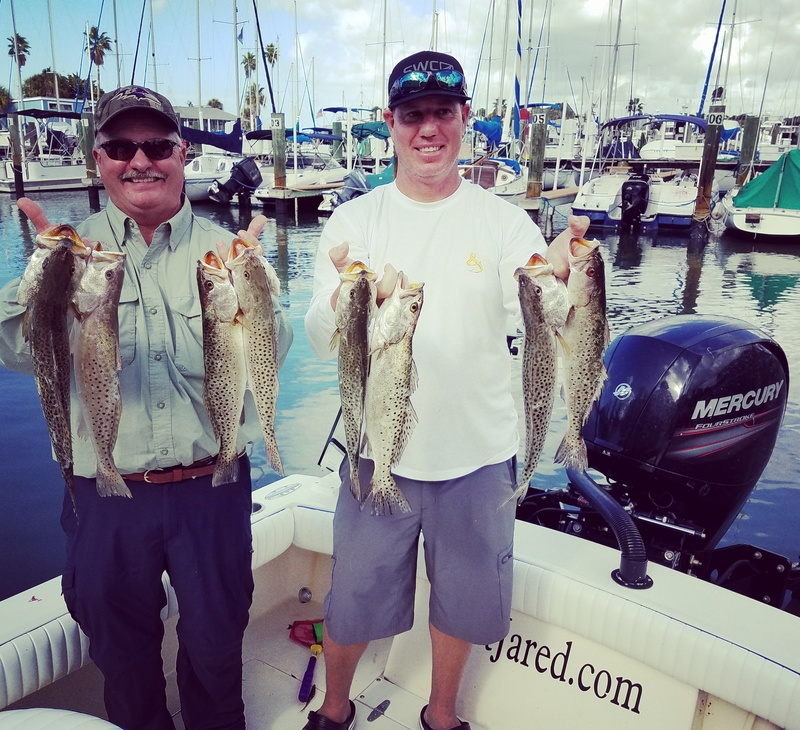 February has had some fantastic weather and great fishing both in Tampa Bay and Clearwater water har bor, and it should continue to be good until late summer. So don’t wait, come join us either this Spring or for the awesome action! Now to the current report…In Tampa Bay the Snook, redfish, and trout have all been biting and biting well! Snook fishing has been awesome lately with the warm winter we are having and plenty of bait still around. 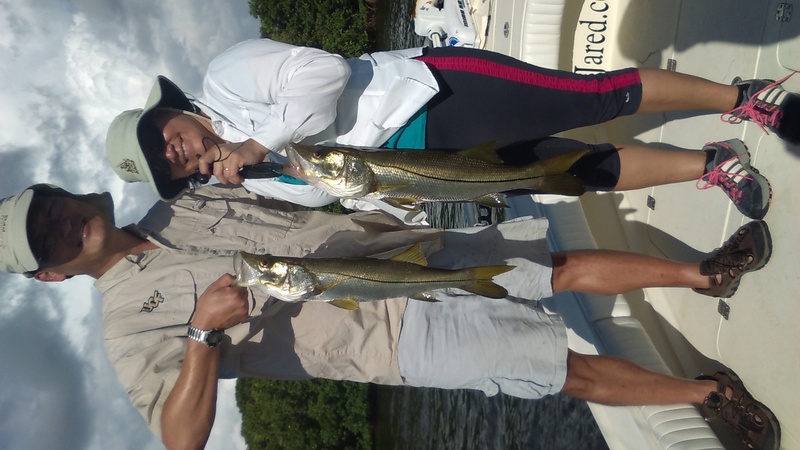 Most of the Snook as of lately have been smaller, but the numbers are there. Snook fishing with be good for the coming months, and will be best around the stronger new and full moon tides. Redfish are really starting to show up in the bay as of last week. And they are going to keep coming as Spring approaches. They are willing to eat just about anything right now once located. Put your time in and you will find them. Trout fishing has been outstanding this entire winter and are one of the main targets during the cooler months. live shrimp and artificial jigs have been producing easy limits of quality size fish every trip we had in the last few weeks. 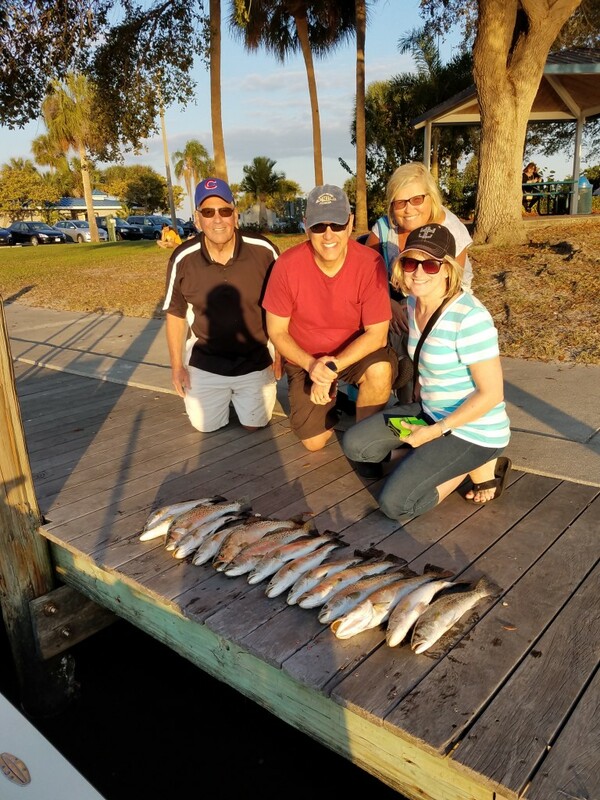 Clearwater harbor and jetty have been producing plenty of trout, sheepshead, and few redfish on the few trips out. Live shrimp fished near the bottom with a knocker rig are working well. Trout fishing has been the main target lately with the wired warm winter we are having. 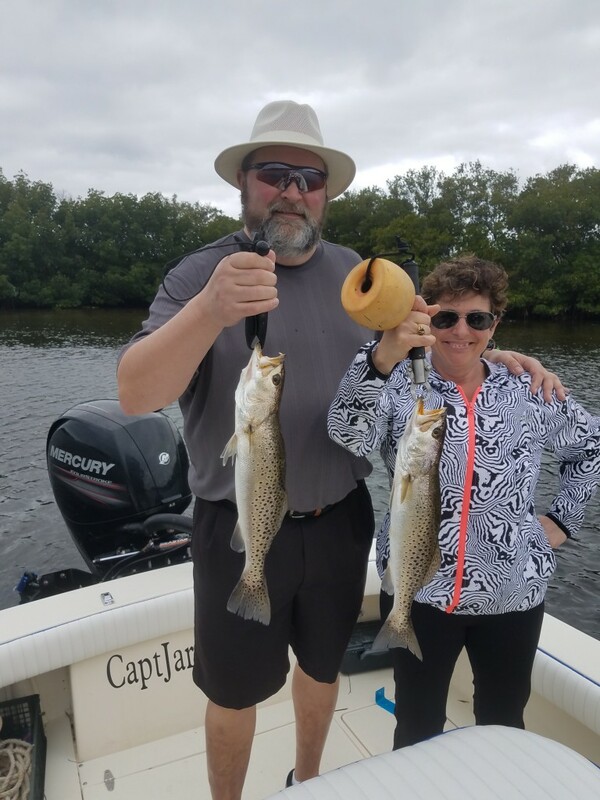 The temperature has been in the high 70’s and 80’s, so if its freezing up north come on down to sunny Florida and lets go trout fishing! We have been catching a lot of quality size fish on artificial lures, but for anglers that want live bait shrimp have been working well. 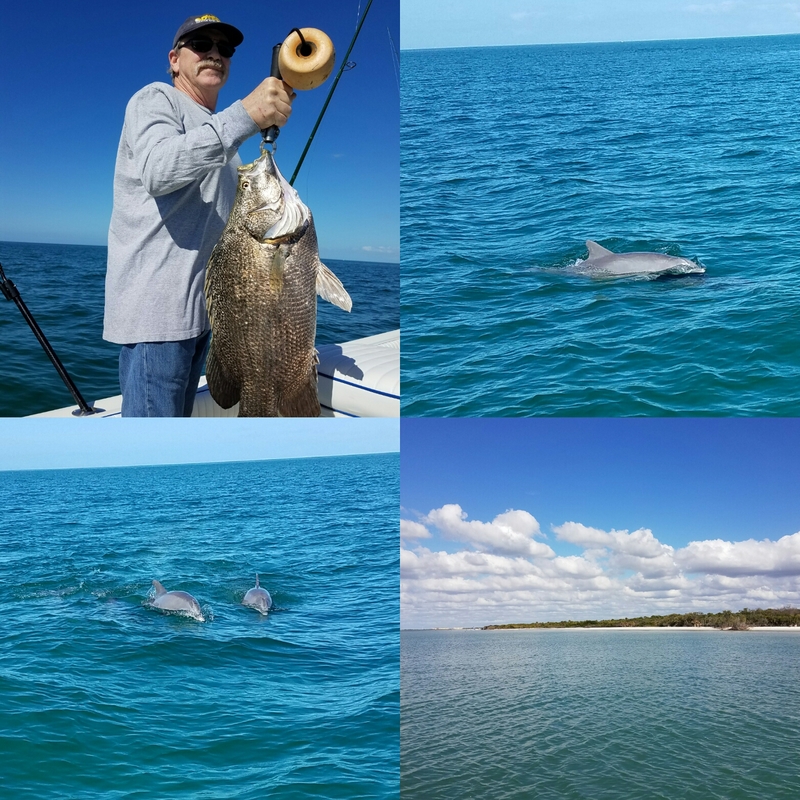 Triple tail fishing has still been good off Clearwater beach, and on calm days we have been making the run to look for them. This is also a great way to see the Dolphins for anyone that would like to see the awesome animals! 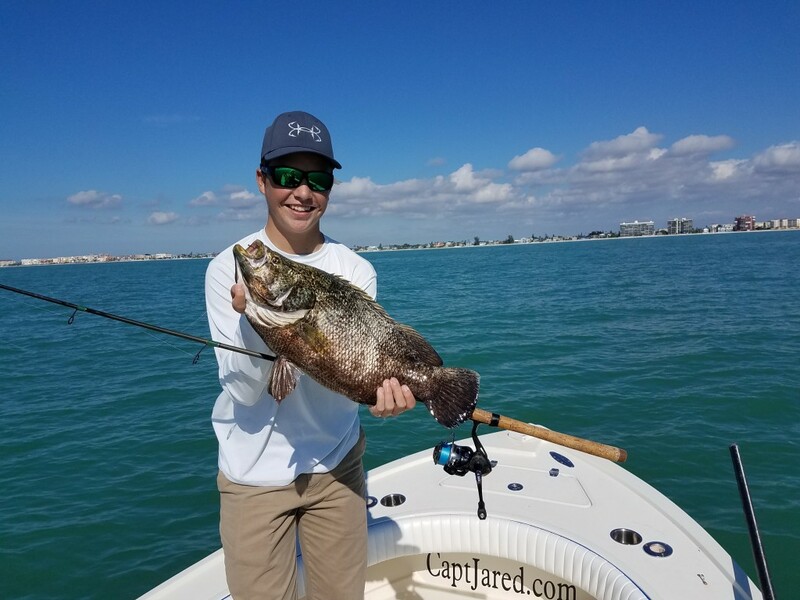 December fishing has been awesome with warm winter we have been having here in Clearwater beach, Fl. 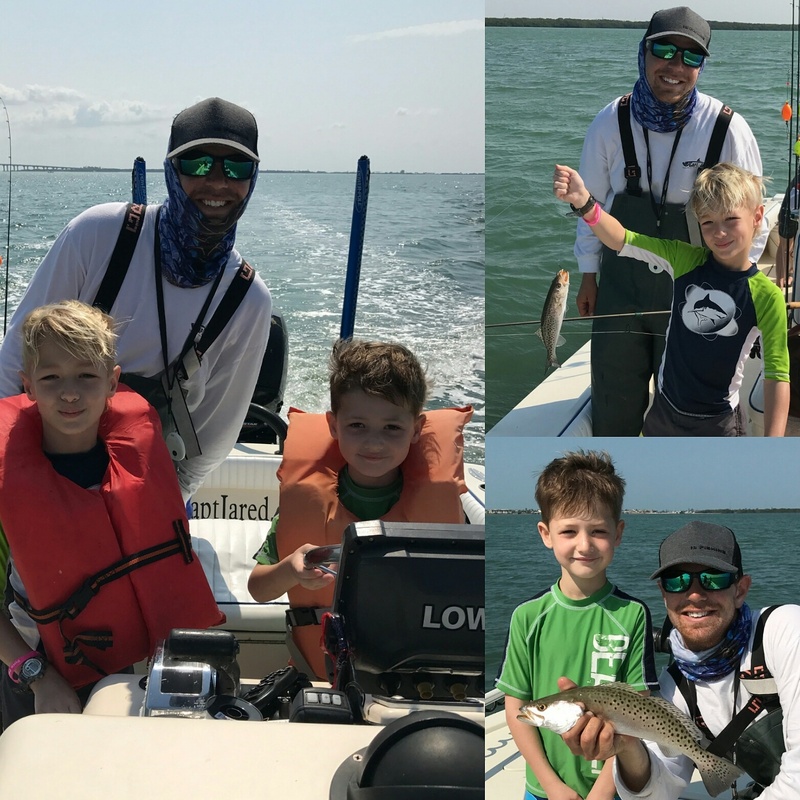 Trout, Triple Tail, Redfish, mackerel and many more have been caught over the last couple of weeks, and to top it off it has been 70 degrees and Sunny! Trout fishing has been outstanding for the last couple of weeks, and it should remain good throughout the month. Most of the trout we have been catching have been keepers and make great table fair if you decide to keep a few for dinner! These fish have been biting on both live and artificial bait fish and are a great fight on light tackle. Triple tail fishing has good for the anglers willing to invest the time to find them. There hasn’t been many but they have been large. 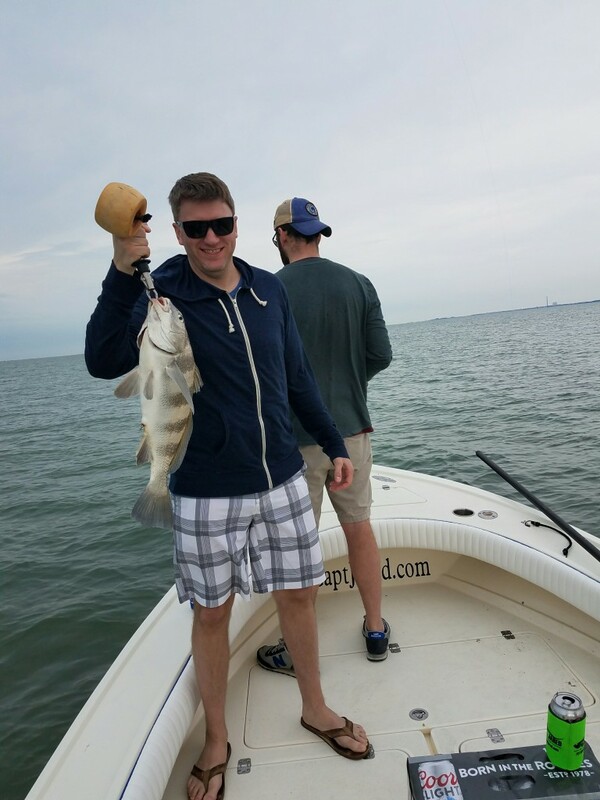 Triple tail fishing should improve as the month goes on. These fish have been biting on live shrimp and small flies. We do have fly rods for anyone wanting to fly fish! 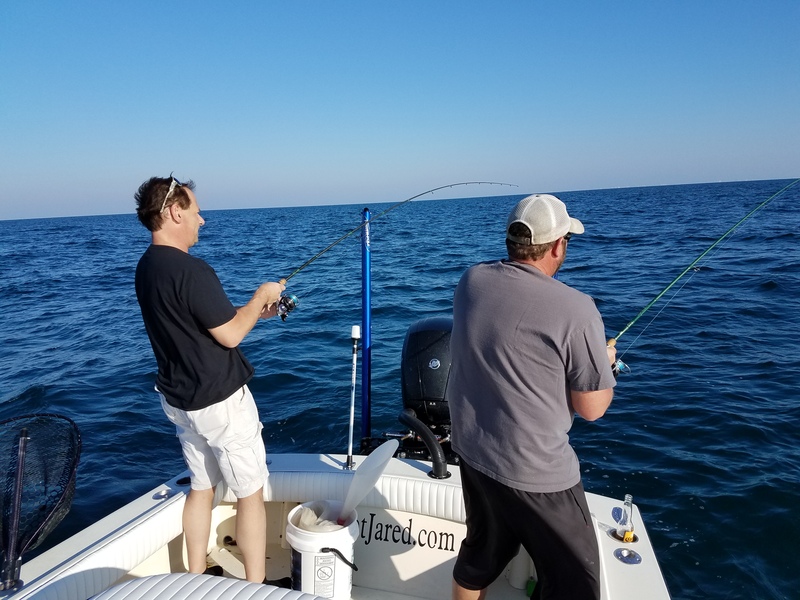 Was gone for the the fist half of the month, but I’m back and have gotten to do a few charters, so here is a report for both Tampa bay, and Clearwater beach area. 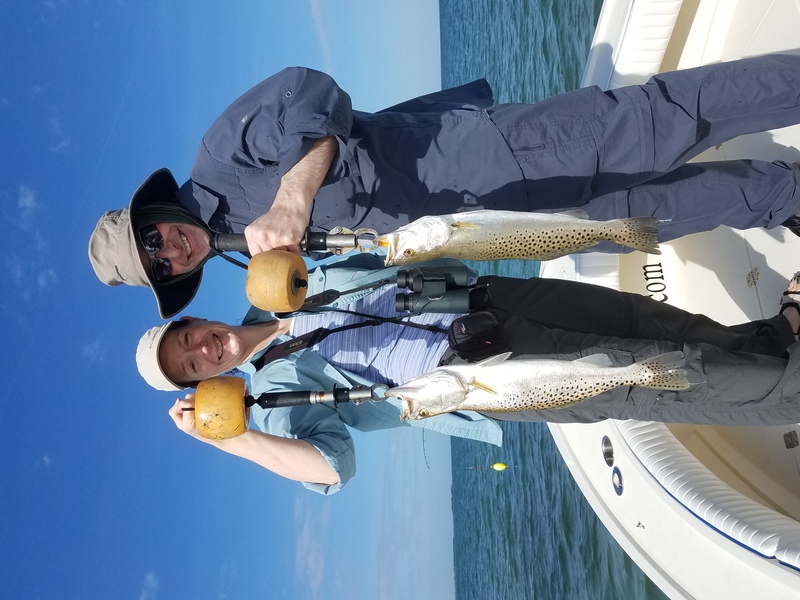 Trout have moved in good, redfish are biting, and the mackerel run is in full swing! 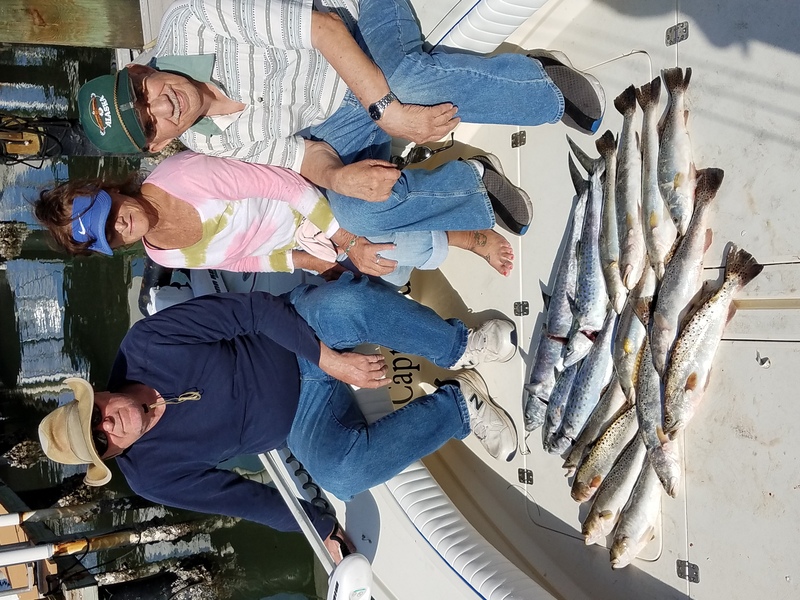 In Clearwater area the trout fishing has gotten even better with the colder weather moving in and the fish bunching up. The trout bite will remain good all winter and will be a main target. 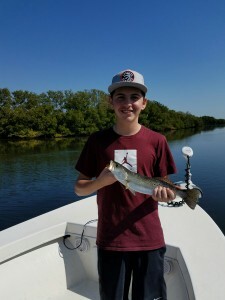 Most of the trout on recent charters this week were in the 18″ range with a few larger. Live sardines are still around and working well. Swede, Lynn, Russ with a nice limit of fish for Thanksgiving! 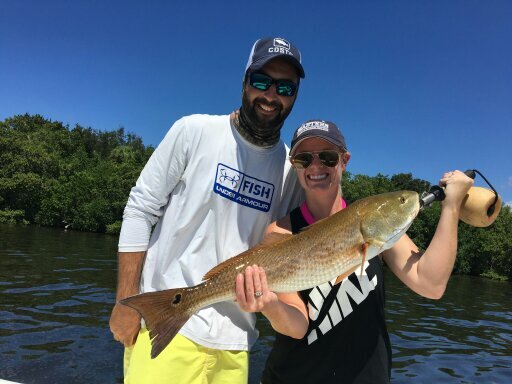 Redfish have broken up into smaller schools from the previous month, but are around for the anglers looking to knock that off the bucket list. Most the the redfish have been slot size 18″-27″. Live sardines, and live shrimp are working well. 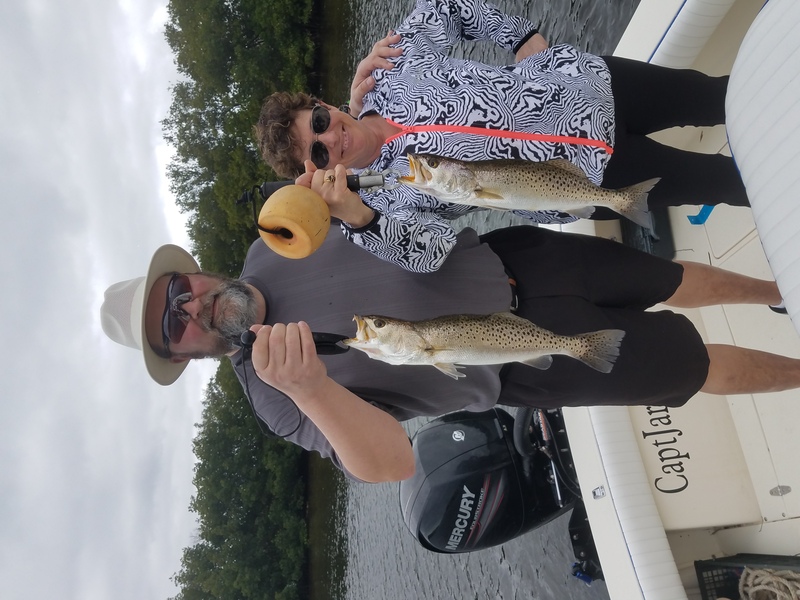 Double header Redfish and Trout! Mackerel both Spanish and King are just off the beaches eating any bait fish in sight. If the weather allows we have been running just off the beach targeting these fish. Fall Fishing is here and it’s GOOD!!!!! 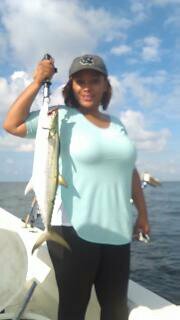 October is an outstanding month to fish with great weather here in the Clearwater/Tampa area. Redfish, Snook, Trout, Mackerel, King mackerel are the targets this month plus a few extra, and there will be some really nice fish caught on the upcoming charters this month..
Redfish have been a main target over the month of September here in the Tampa bay area, and the action it will only improve as we get further into October. The fish will starting schooling up in good number in preparation for the spawn. This makes for great action once the fish are found. These fish can be some of the biggest caught all year! 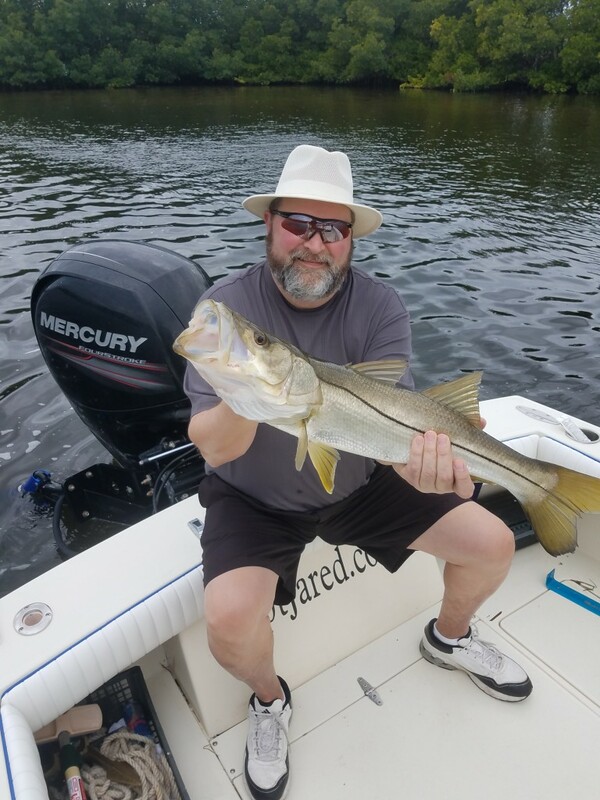 Snook fishing is getting good as the water cools down, and the fish are moving into there winter areas. 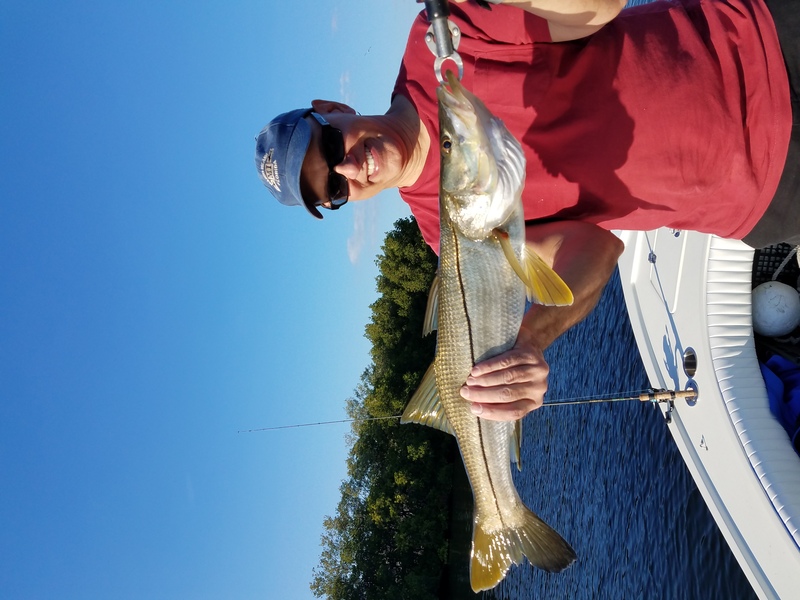 Snook bite will be good during the rest of october and into the first half of november. These hard fighting fish know where they live, and will break you off if you aren’t quick enough.. The are much like a saltwater bass, but will a little more fight. Trout fishing has been GREAT!!! 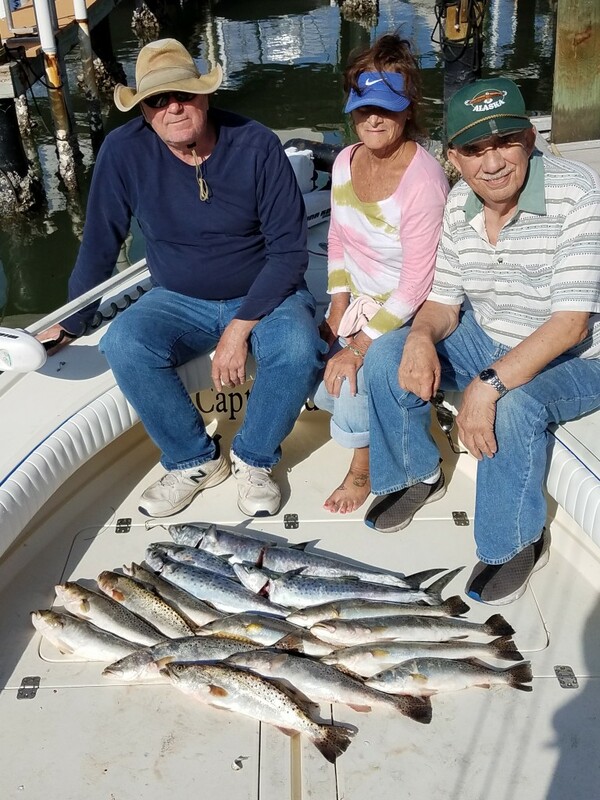 Trout are biting good the on the morning charters fishing with live sardines and a bobber over grass bottom in the 4′-6′ range. Most of the trout have been between 14″-19″, but a few larger have been caught recently. Trout fishing is a great way to spend the morning with no pressure. Mackerel Both Spanish and King have been around and will pull some drag if you are looking for a good fight! 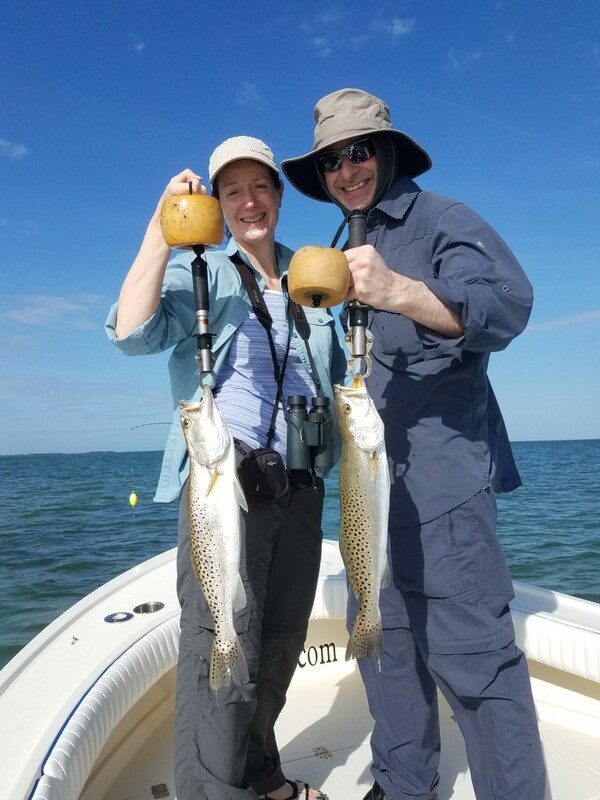 Clearwater beach area is a great place to both both of these speedy fish as they migrate up and down the gulf beaches in both the spring and fall following bait schools. We have been targeting these fish on the nearshore reefs just a few miles of the beaches. The mackerel run will last into December. Let me know if you want to target some of these on your next fishing charter! 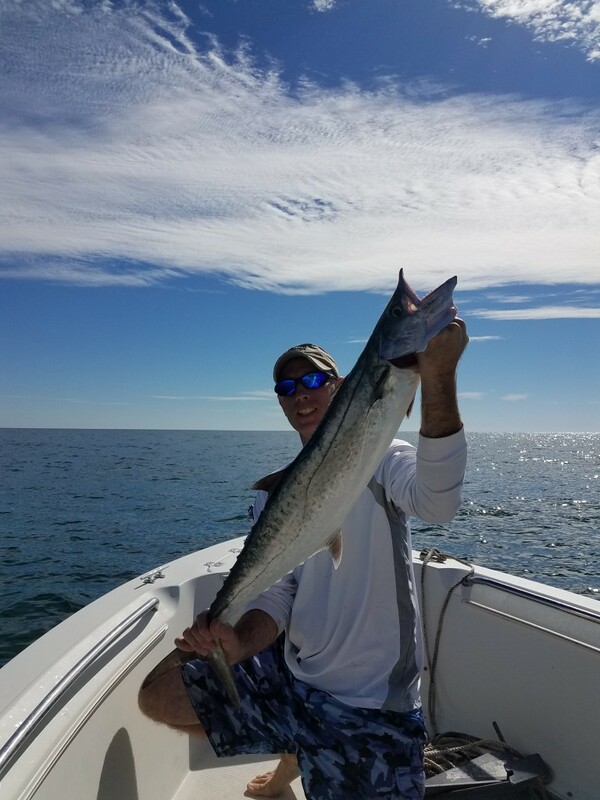 September Fishing has been good in Clearwater beach and Tampa bay for anglers looking to get out and do some charter fishing! 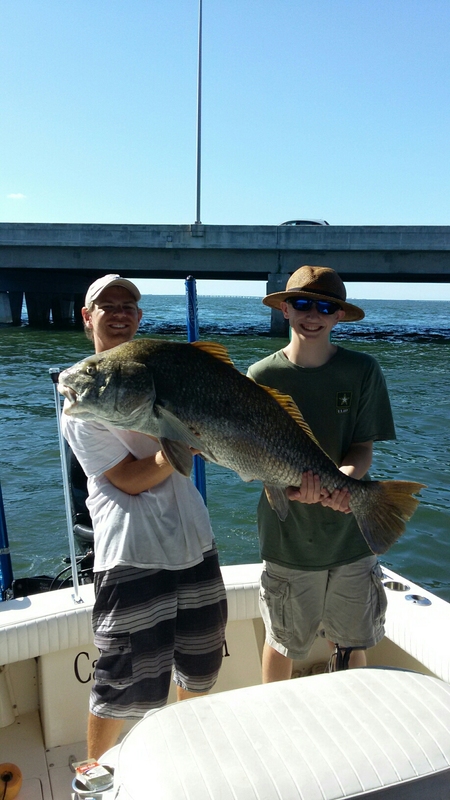 Redfish, Snook, Spanish Mackerel, and Mangrove snapper have provide anglers plenty of action as of lately..! Redfish have moved into the Clearwater harbor area, and have provided consistent action over the last couple of days. 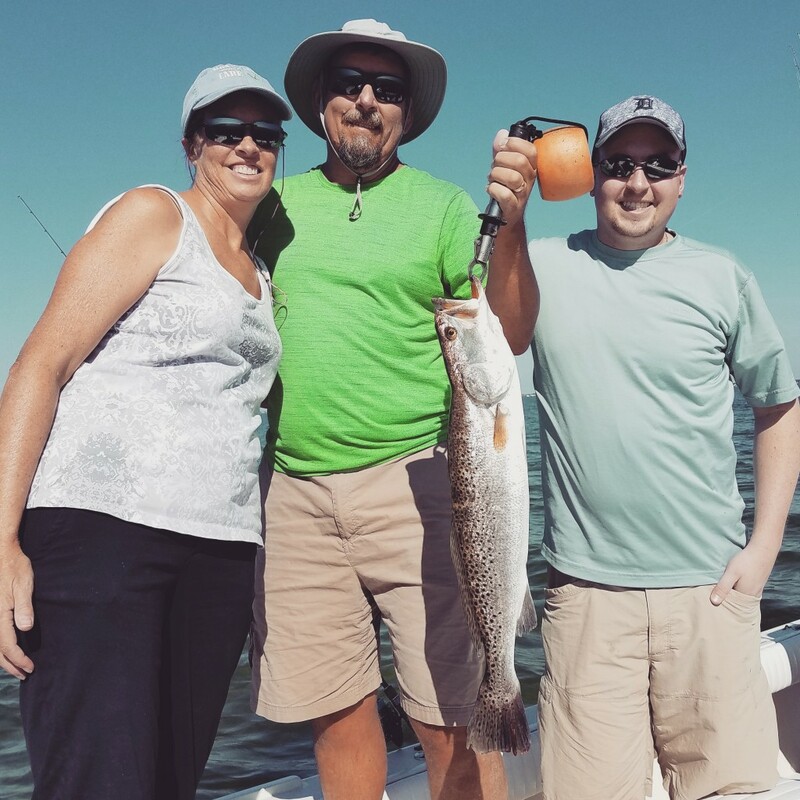 Most of the fish have been lower to mid slot size in the area and are perfect for that “blackened Redfish” recipe! 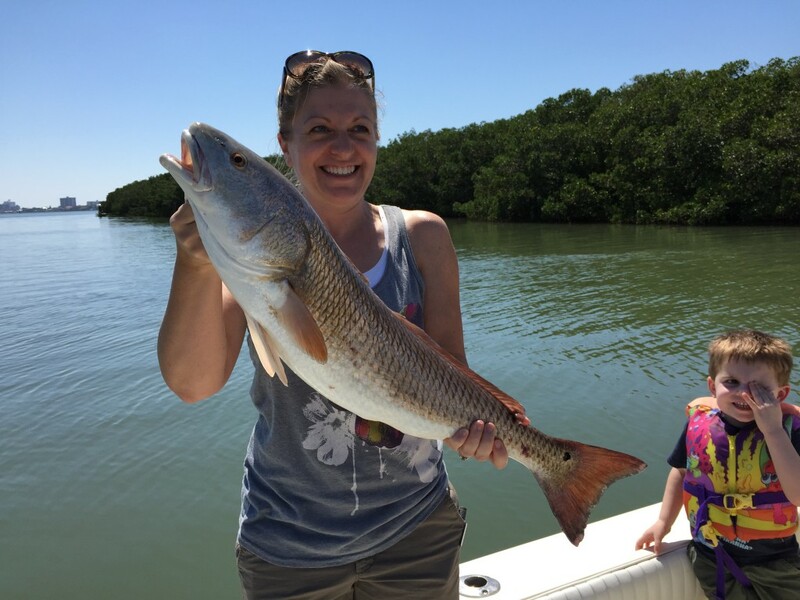 The slot limit on Redfish in our area is 1 per person, and 18”-27”. the Redfish action will be good throughout October!! 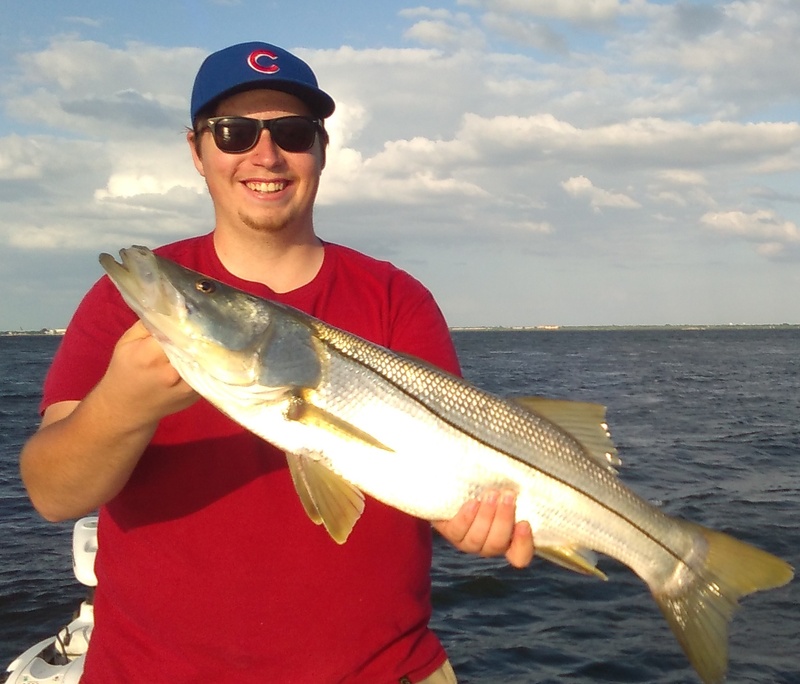 Snook season is now open, and the Snook are on the move in Tampa Bay! Most of the have finished spawning and are ready to feed if you can find them! 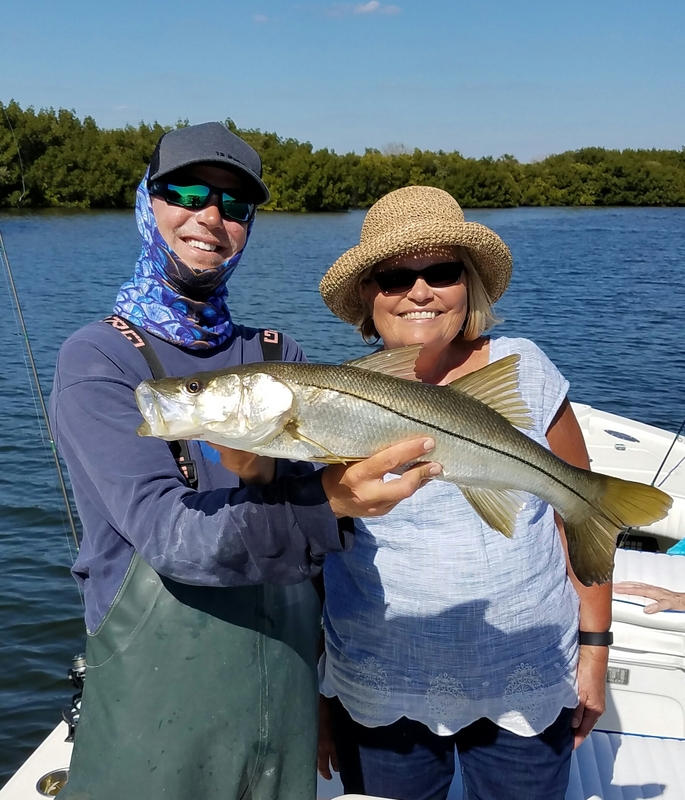 The Snook bite has been decent, but but outstanding, but for anglers looking to target only Snook the action can be had, and once the fish are found the wait can be worth it! 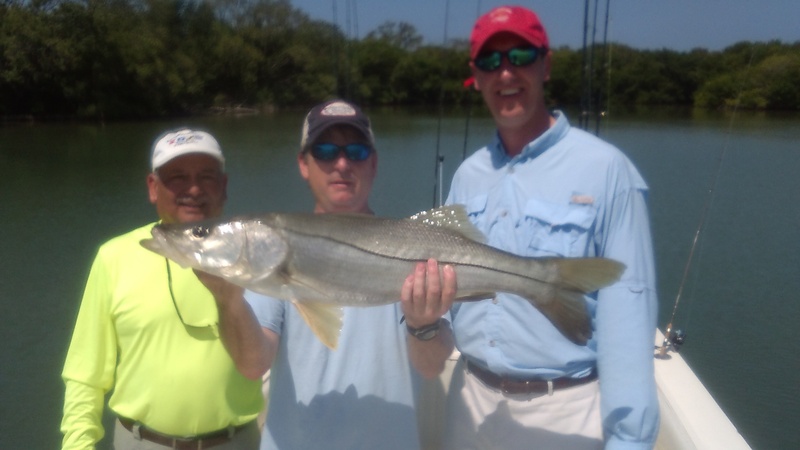 Snook season will be open until November 30th. The size limit is 28”-33” 1 per. Person. 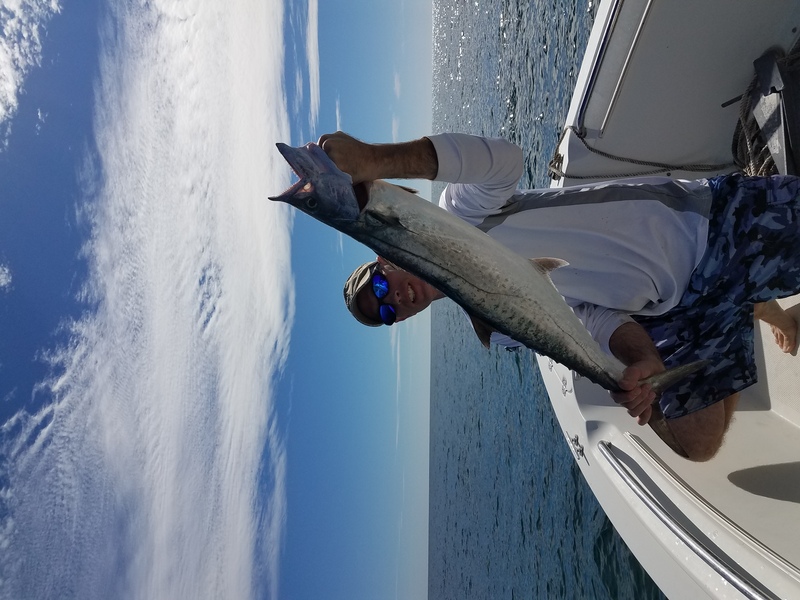 Nearshore fishing has been great for Mackerel, Bluefish, and snapper over the past week and the action should remain good throughout the rest of September. 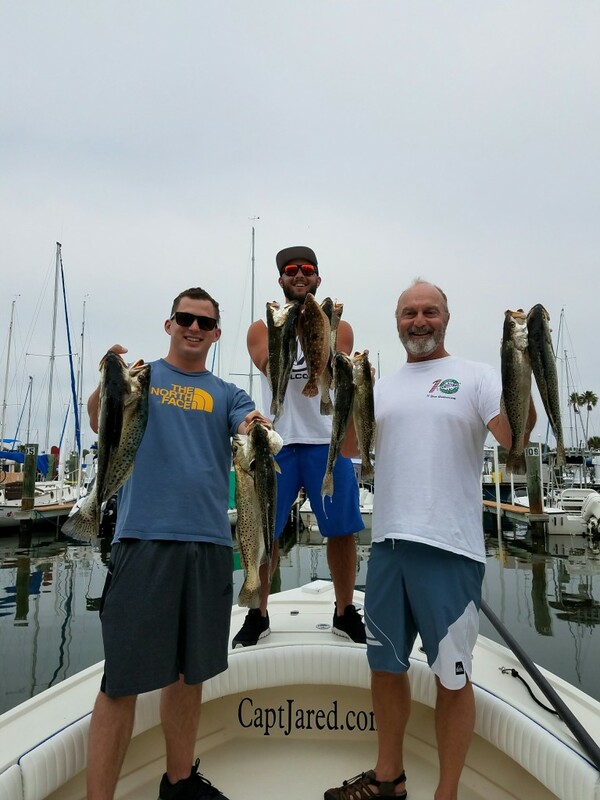 Both fish provide good steady action for the families and friends alike, and provide good table fair if you decide to take a few fish home for dinner!! 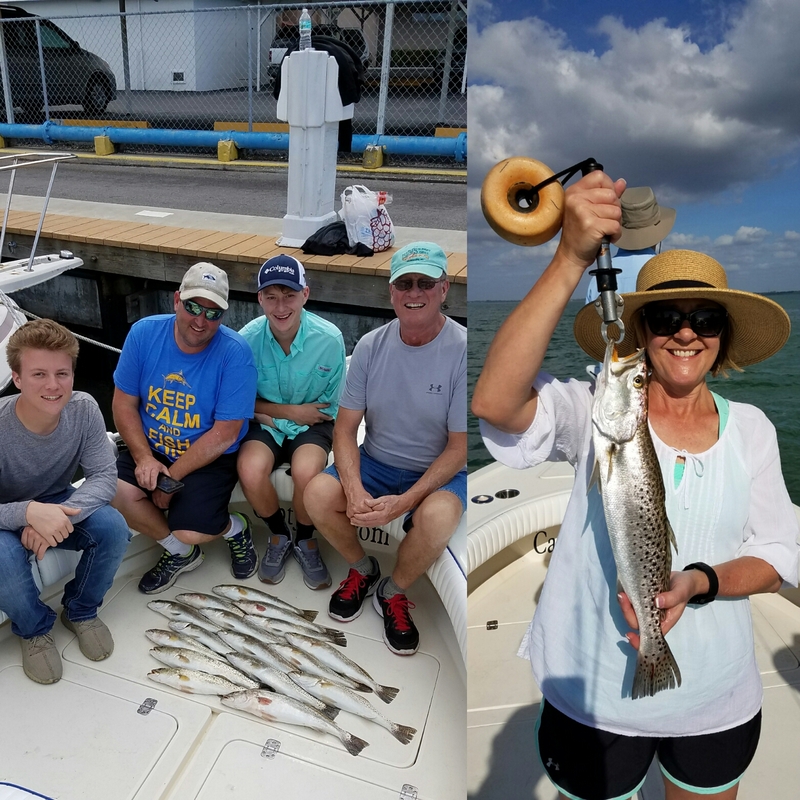 Fishing charters in the Clearwater, Tampa, St.Pete area are hot during the month of August for both the people… and the Fishing!!! For anglers that are willing to fish during the dog days of summer the rewards can be worth it. 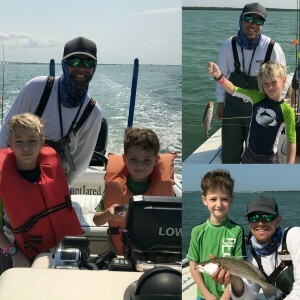 Tarpon, Snook, Redfish, Huge Black drum, Snapper and permit are schooled up and have been providing awesome action, Scallop season is still open, and Night fishing is also an option! Kids are getting ready to go back to school, but for those that don’t have those obligations and are wanting to get out now is a great time. We have almost exclusively been fishing the morning to avoid the afternoon storms, but this week has been opposite with storms forcing cancellations most of this week, but the rest of the month be should be back on track fishing every day! 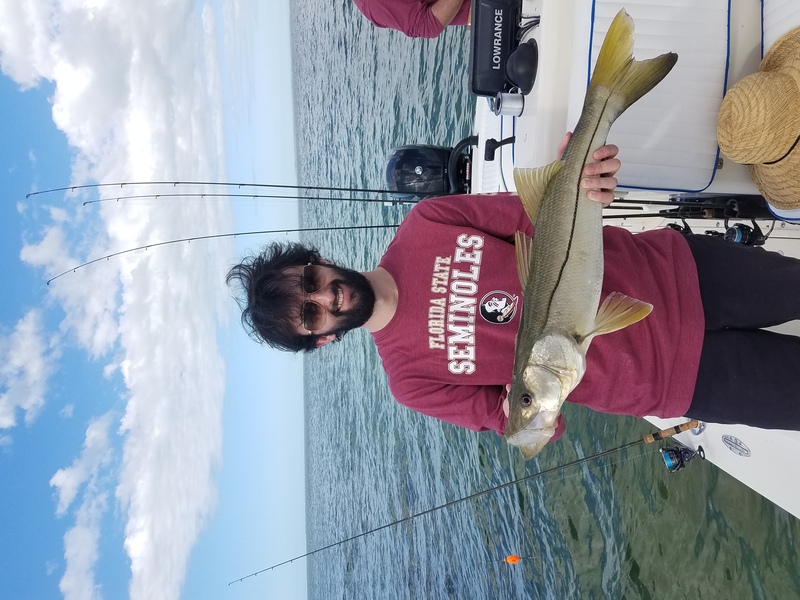 Snook have spawned for the most part and are slowly leaving the beaches and passes making there way back into the bays and estuary, not all the fish will leave beaches but the vast majority are in the process of leaving. Snook fishing will be good as these fish will be hungry since they have spawned. Live sardines will be key to fishing the snook in the coming weeks, and having a steady supply will be worth the effort. Red fishing is turning on better and better each day as the schools of fish come into the bay gathering up for the spawning season. 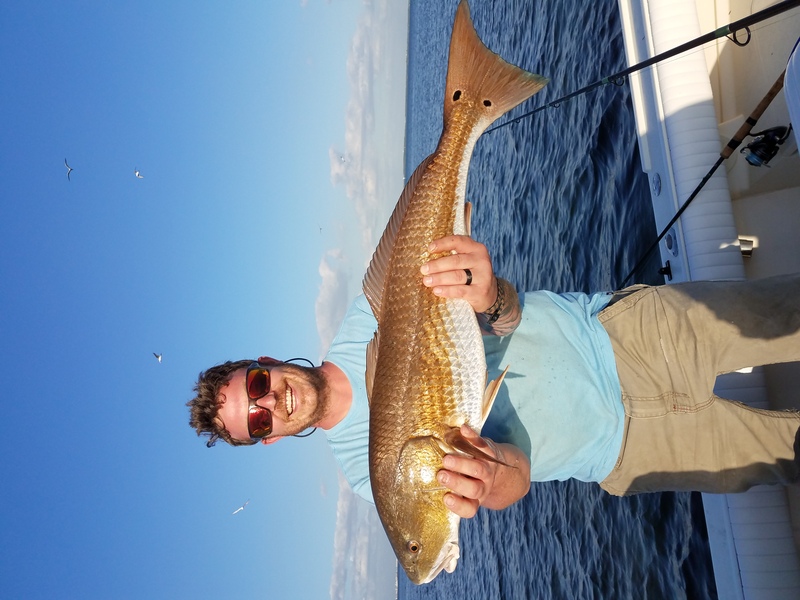 Schools of over slot Redfish can be found this time of year for anglers willing to invest the time, Sometimes it takes awhile to locate the fish as they move up and down the flats but once located and fished with live and cut bait the rewards can be worth the effort. 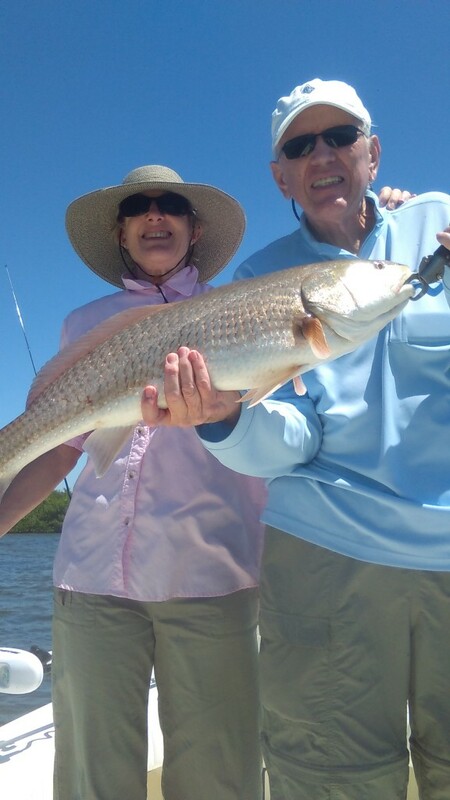 Slot size Redfish have also been around in fair numbers in the areas im fishing. 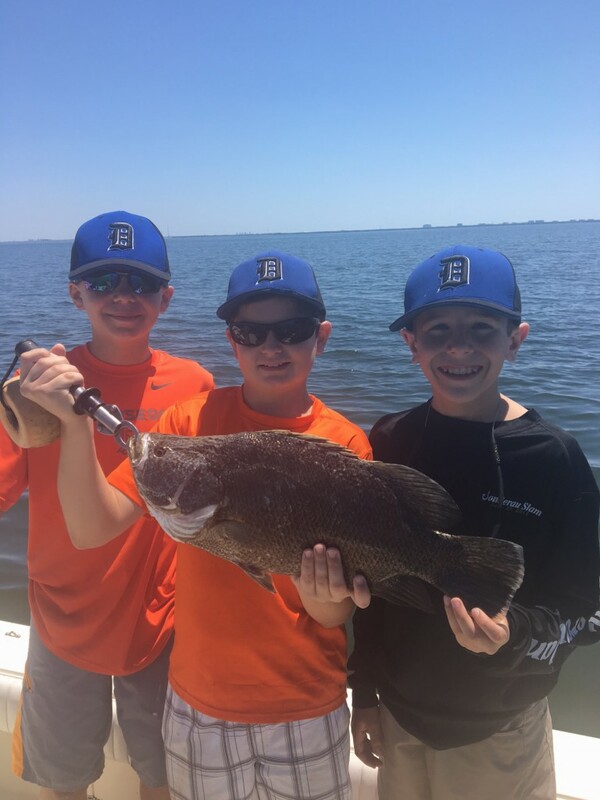 Monster black drum are covering the bay bridges and for the anglers looking to tangle with these giant fish there have been a ton of them around. Fresh blue crabs fished around the bridges have been producing they brutes, and jigs will also work. These fish range in size from 10lbs up to 60lbs, and once a school is located they are willing to bite. Snapper fishing has been outstanding. Limits of these snapper have been coming quickly, and they are great table fair. The limit of snapper is 5 fish per person, and they average about 13” in size. Typically we fish around structure, which can be anything from artificial reefs to bridges. Live sardines free-lined or on the bottom work well. 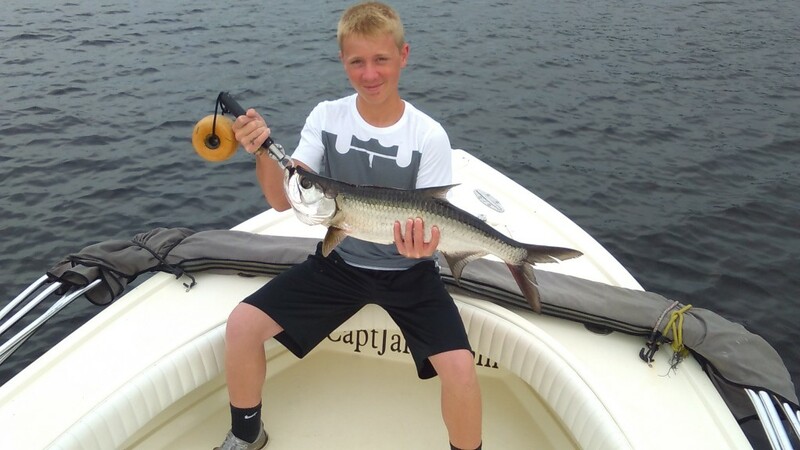 Tarpon fishing has still been hot and the fish of all size are around. 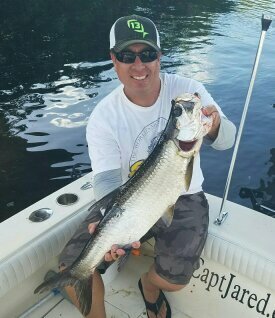 Now that the spawn is over the breeder size Tarpon are feeding heavily in preparation for winter, and if you can find them it can be outstanding action. Smaller tarpon are also around in the 1-20lb range and are a blast to catch with light tackle and fly. 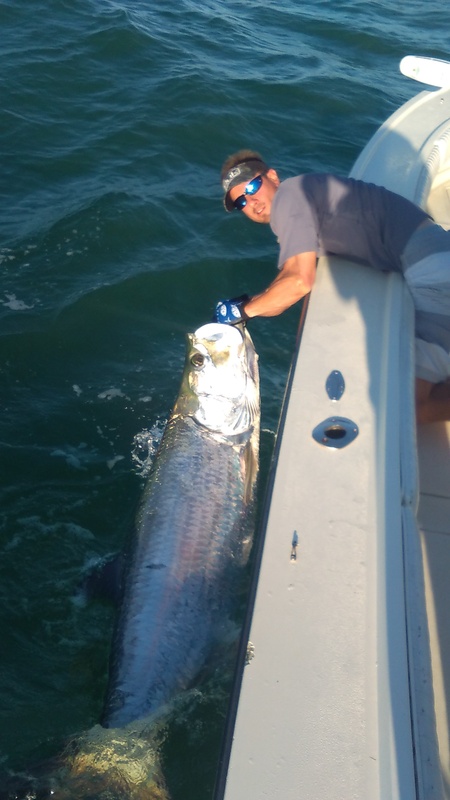 Tarpon fishing will remain good for the next few months. 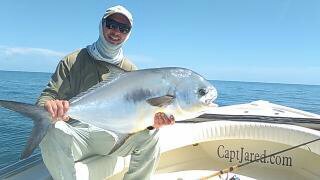 Permit have been around for anglers looking to catch there “Bucket list fish”. Permit are schooled up and for anglers looking to target them nothing beats a live crab for these fish. Permit have been in 10-25lb range and will hang around for the next couple of months. 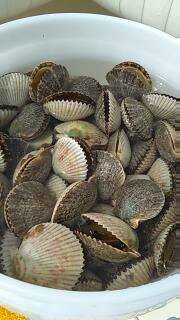 Scallop season is still open and this year has been awesome with nice limits of scallops being caught on most trips. 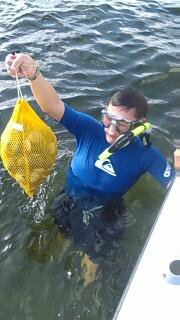 We have been finding scallops in the 2′-6′ range NW of the Homosassa River. The limit on scallops is 2gals per diver, and 10gals per boat. Scallop season runs until September 24th. July has been a hot month as it always is, and the afternoon thunderstorms over Tampa Bay haven’t let us down each day. 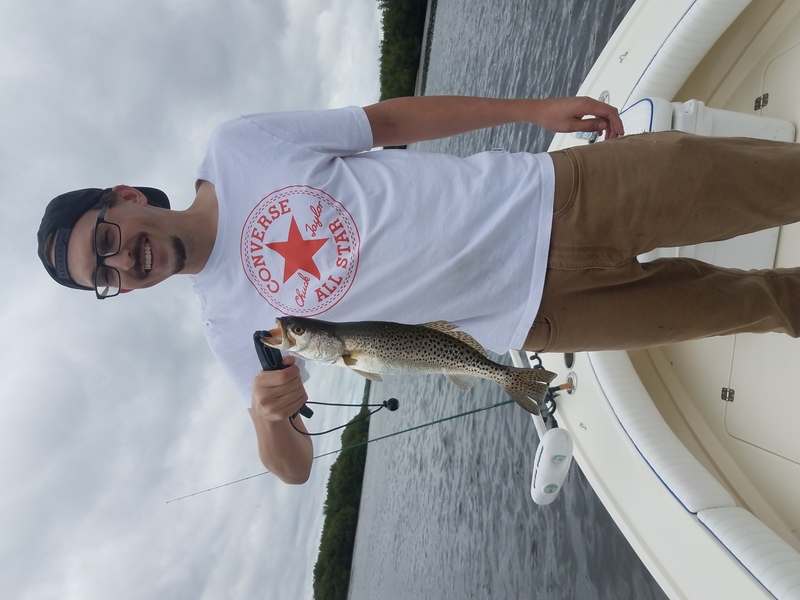 The fishing has been pretty good as of lately for mangrove snapper, mackerel, Tarpon, and sharks. Scallop season has began in Homosassa, Fl and it is a great way to avoid the heat while spending time with family and friends! Tarpon fishing has been outstanding this post season and it should remain outstanding by the looks of things. There are tarpon just about everywhere in the bay and they are all sizes from 10 pounds to 150 pounds. Post season tarpon fishing can be some of the best of the year, and fishing with artificial lures like the DOA baitbuster or other swim baits are hard to beat. Look for Tarpon to be around the shipping channel edges, live bottom areas, reef, bridges, dredge holes, and areas holding large quantities of bait. 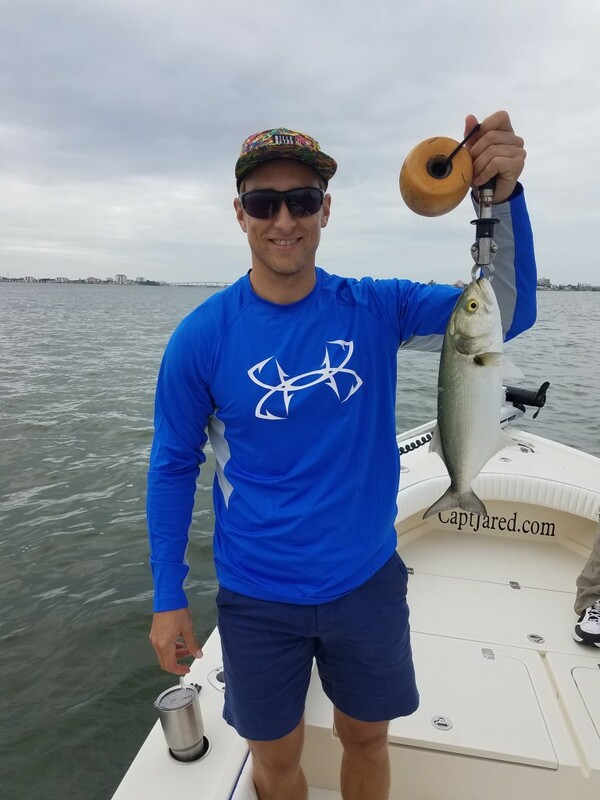 Live bait such as threadfins, ladyfish, pinfish will produce bites, as well as dead baits on the bottom. Shark Fishing this year in the Clearwater &Tampa area has been outstanding, and maybe even the best I have seen. Sharks can be found just about anywhere bait is present. The larger the bait the larger the sharks. Heavy spinning gear and wire leaders are a must, as sometimes you will hook a giant! I have mainly been fishing along the channel edge with cut ladyfish, mackerel, and jacks for bait and the black tips in the 3′ range have been the most common, with a few hammer heads, bonnets, and nurse sharks in the mix. Remember black tip sharks can be great eating! 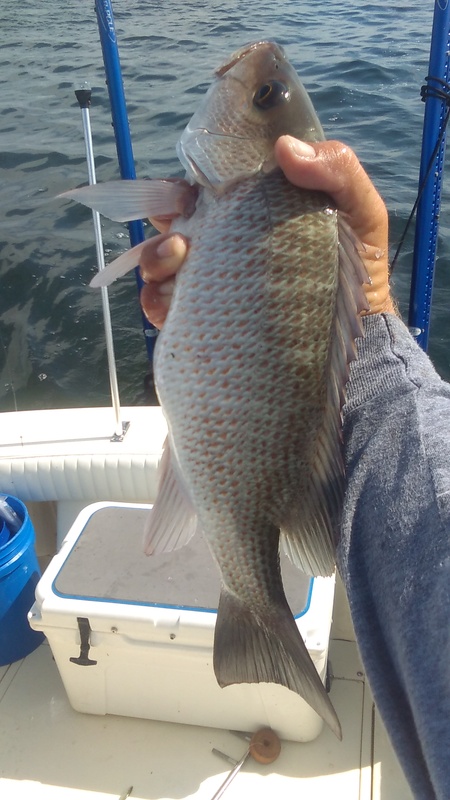 Mangrove snapper fishing has been amazing this year while fishing over the pubic reefs inside of Tampa bay. Right now the bait has been tiny and this is the perfect time to target these bay snapper. Look for snapper in the 12-16” range on any structure in the bay right now. If the current is slow you can get away free lining small white baits on a 20lb leader with a #2 hook, if the current is moving use enough weight to reach the bottom. The limit on snapper is 10 per. Person at 12”. 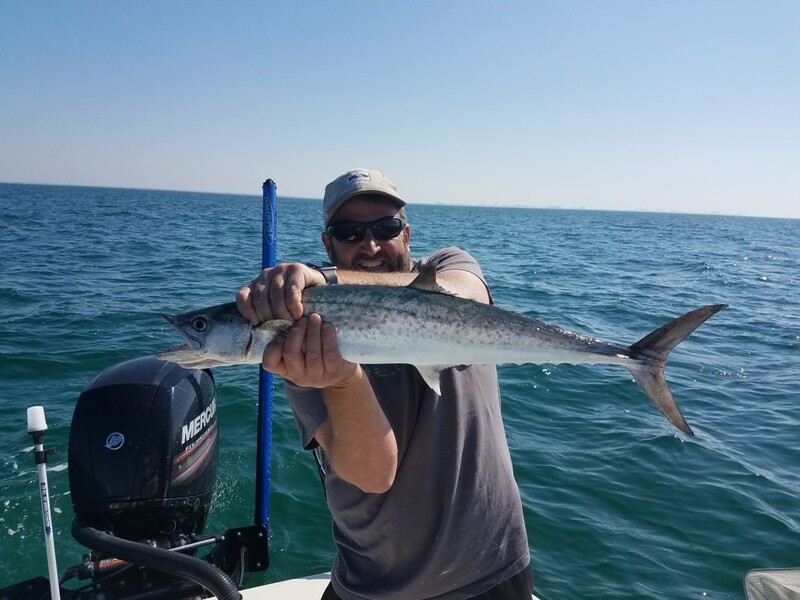 Spanish Mackerel have been all over the bay along the channel edges and some of these fish have been quite large! Fishing along the dump banks that line the edge of the channel has been producing limits of mackerel if you are will to weed through the lady fish. Once anchored along the edge of these bacnks deploy some chum, and keep it flowing and the action will find you, and once it starts it doesn’t stop. Use a 40lb. Leader and a long shark 1/0 J hook for best success . Scalloping out of Homosassa, Fl has been decent. Some days limit of scallops are easy other days we don’t always get a full limit, but we sure do have fun trying! Water depths have been between 4-8′. Look for the scallops to be over the patchy grassy sandy areas. The scallops can be in the grass but are harder to see, but during slack tide you will have a good opportunity to get them in the grass. The limit is 2 gals per. Person or 10 gals. Per. Boat in the shell. Remember to be careful around other boaters with dive flags up and idle if you are with in a half mile or less. I see to many boats speeding around boats with divers in the water, and remember to always have someone on the boat to be a look out and keep an eye on everyone in the water. 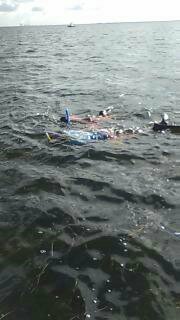 Scalloping season will run until September 24th and if you want book a scalloping charter give me a call. Bit Report: Bait has been small and a ¼” cast is required. Larger bait can been found around the markers and bridges. Cut bait is a great alternative to live bait this time of year. 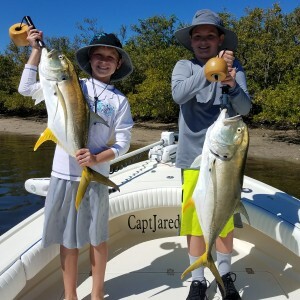 For Snook fisherman live grunts and pinfsh can be caught on sabki rigs tipped with squid. 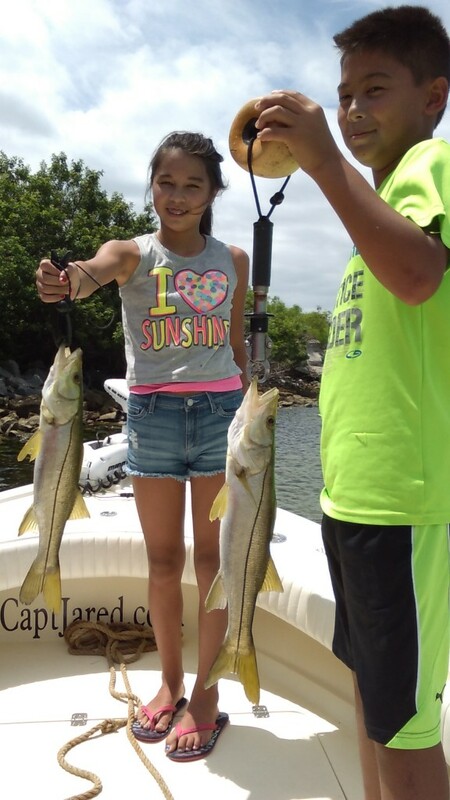 Snook Fishing has been good along the beaches and in the passes. 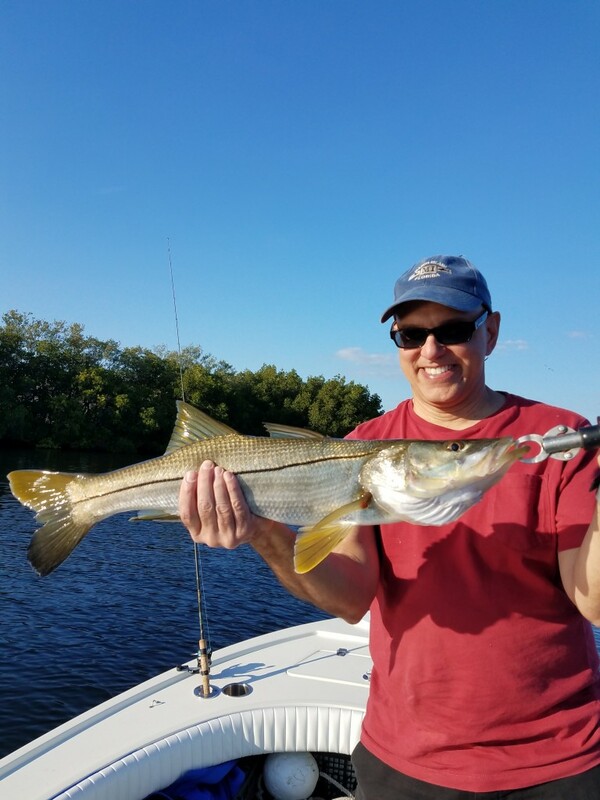 The snook are in the passes spawning during the months of June and July and the chances of catching a nice snook are very good! Anglers wanting to target these hard pulling fish will have no problem catching them on a half day trip. 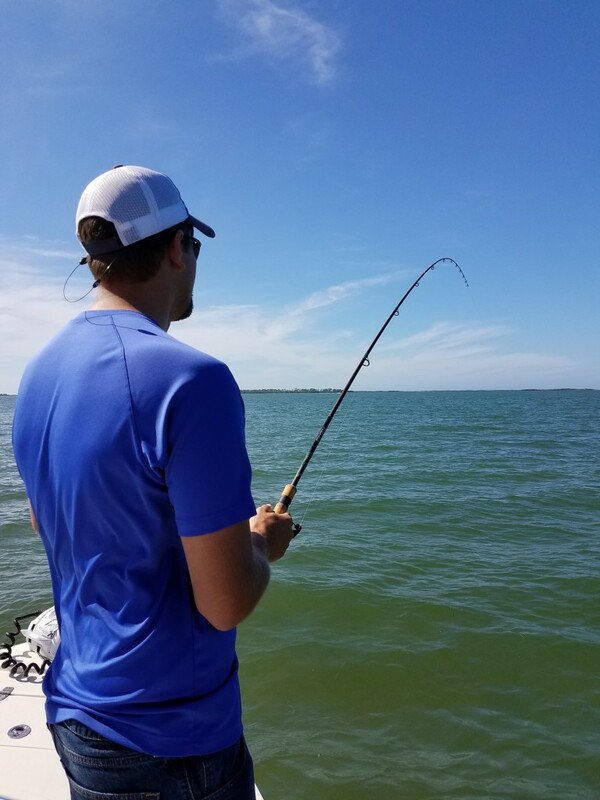 Fishing typically is better in the morning or evening, but if the tide is moving the fish will still feed throughout the day. Snook fishing will remain good until the first cold fronts of the year!! June is peak season for Tarpon. These massive game fish invade our local waters this time of year to spawn. During the summer months the Tarpon travel up and down the beaches gathering up in great numbers in preparation for the spawning runs. Targeting these fish can take some patience, but once hooked it is all worth it!! Tarpon on average are between 80-120lbs and are 4-6′ in length! Tarpon fish will be productive all summer long. Mackerel have also entered the bay to spawn and these fish are really schooled up making for some great action on light tackle gear. Mackerel with there long stream line bodies can make long runs, pulling out lots of drag making them an awesome target. Mackerel also make for decent table fair, and great shark bait! For anglers wanting to catch sharks there are plenty around right now following all the bait schools and mackerel schools. 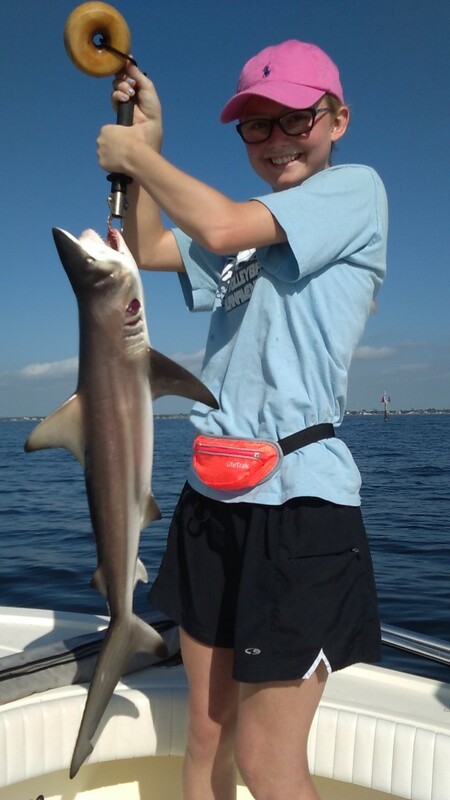 Black tips have been the most common, but we are also getting a few hammer heads, along with sand sharks. 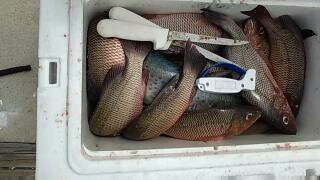 For anglers wanting table fair Mangrove snapper and Scallops are plentiful. In Tampa bay mangrove snapper fishing is starting to turn on for the summer season. Most of the snapper we are targeting are between 10-18”, but they are some of the best eating fish around! These fish will be hanging around any rock structure and are willing to bite small bait fish or shrimp. 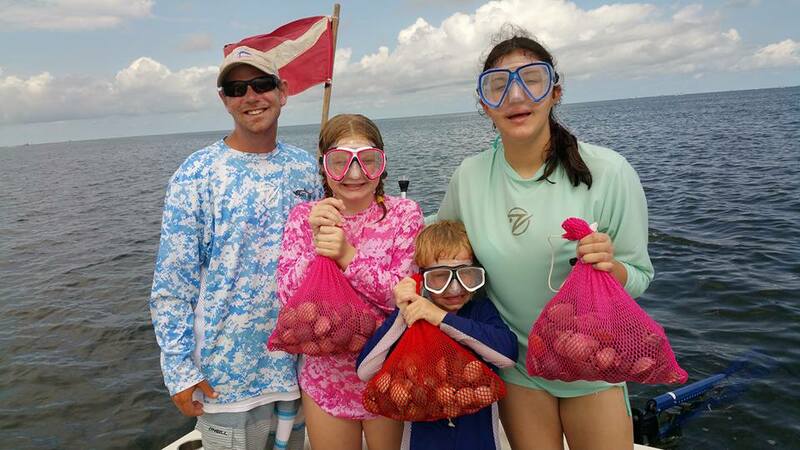 Scallop season has opened in the north, and we have been Scalloping out of Homosassa, Fl. 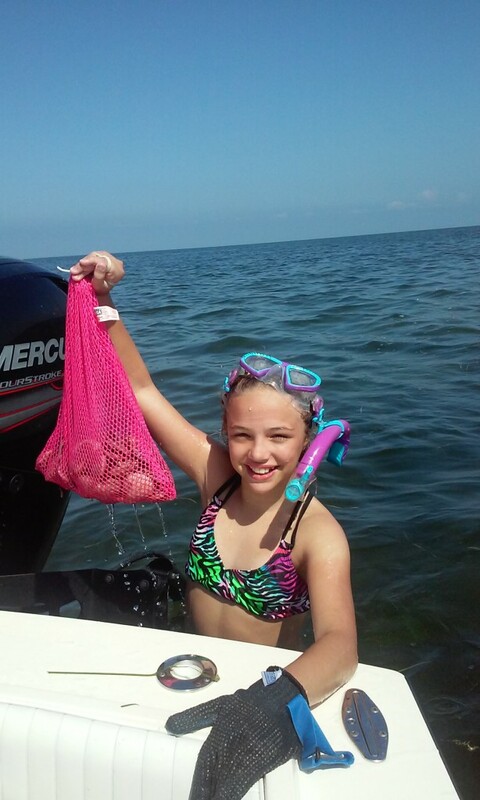 Scalloping is a snorkeling activity, and a great way to stay cool during the summer while catching dinner. Scalloping is typically done in 3-6′ of water over shallow clear grass flats. The scallops rest along the sea bead, and as drift along they can easily be picked up. Opening day was a “One Stop” trip! If you want to book a scallop trip or a fishing charter call or text for available days. 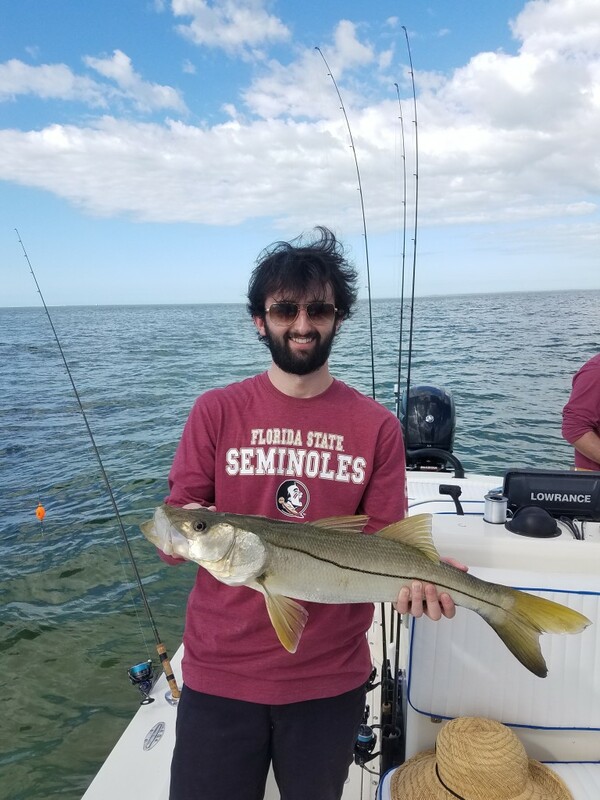 Snook fishing has been very good as of lately, most of the breeder size fish have moved out of the backwaters and are showing up on the beaches and in the passes getting ready for the spawn. The Snook that are in the these areas typically range from 25”- 40”, while the Snook that are 25” and under will remain in the backwaters. Live bait will remain supreme for these fish this time of year. These baits include scaled sardines, threadfin herring, pinfish, grunts, and mullet. Artificial lures such as flair hawk jigs, large swim baits, and lipped jerk baits will also work. 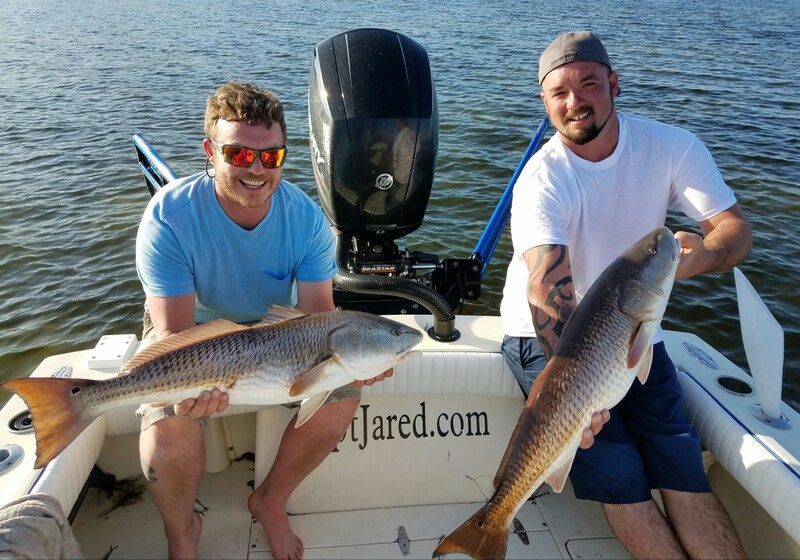 Redfish have been very abundant over the last couple of months and they will remain a hot target throughout the summer months. A lot of the larger size fish are in the area and will remain in the area throughout summer. Live bait and cut bait will both work, but as the days get hotter cut bait will out produce the live bait. Look for the Redfish to be school up this time of year. Mullet schools will also be a good indicator that you are in the right area. 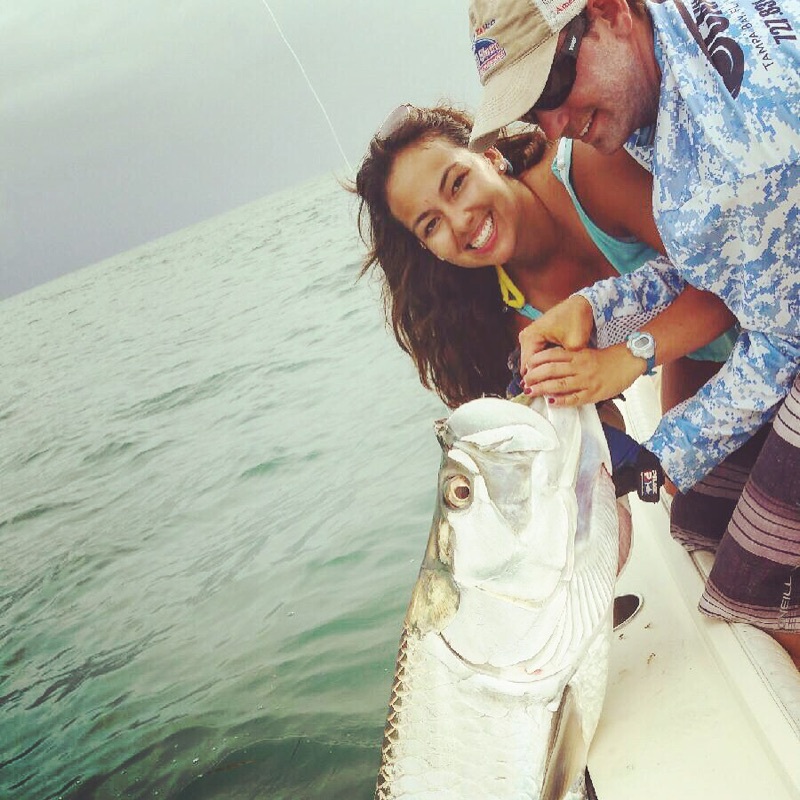 Tarpon season is here and the fishing is getting more consistent by the day. May, June, and July is peak tarpon season for the large breeder size fish. Most of these bigger fish are staging in the mouth of the bay and around the Skway bridge in preparation for the spawn. Look for the fishing to be best around the New and Full moon phase as tides will be stronger. 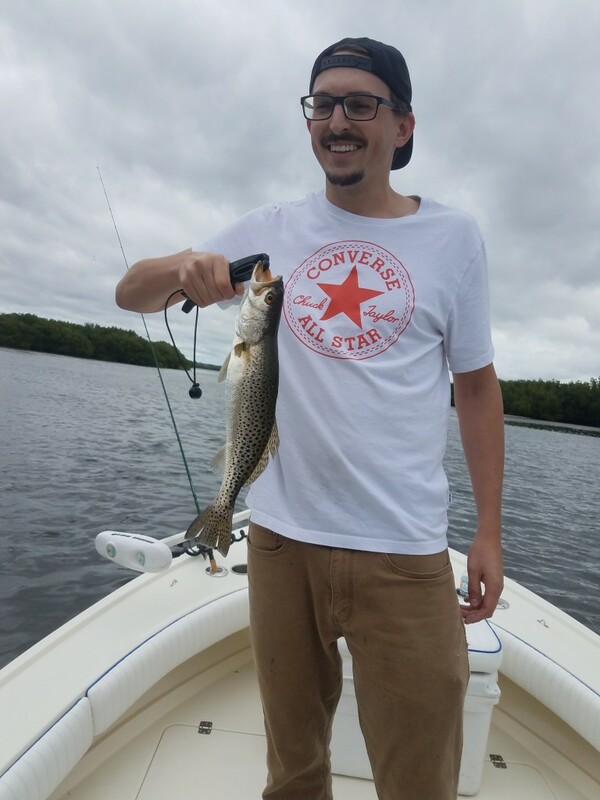 When fishing for Tarpon make sure your tackle is sufficient as the fish are extremely powerful and light tackle fishing is not recommended as it is not good for the fish. Extra heavy rods with large reels spooled with 50lb braid or heavier are necessary to get the fish in, in a timely manner. If sharks get on your fish when hooked up it is best to break the fish off. Triple tail have also been caught quite a bit on recent trips. Look for triple tail to be hanging around floating structure’s such as marker buoys, crab pots, and channel markers. Live sardines, shrimp, crabs, and small pinfish will all work. Small buck-tail jigs and artificial shrimp will also get the bite. 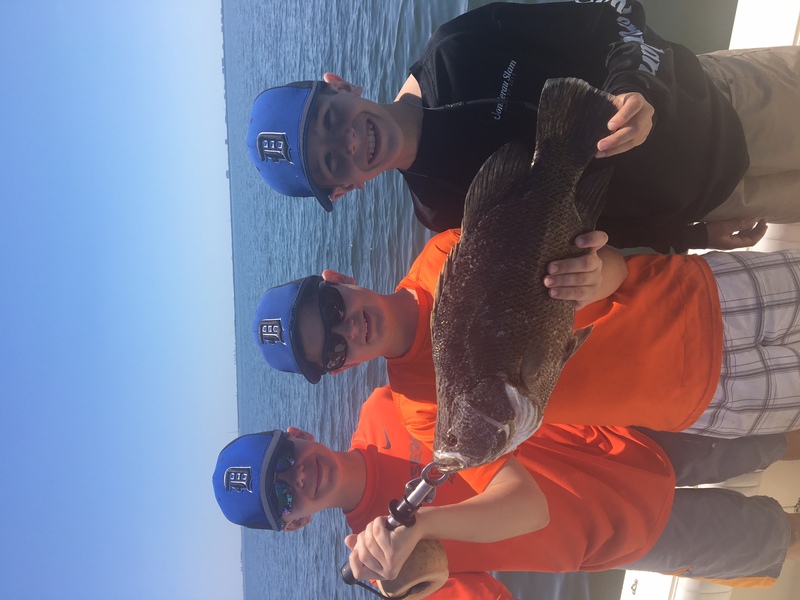 Triple tail have a 2 fish bag limit with a 15”minimum size limit. 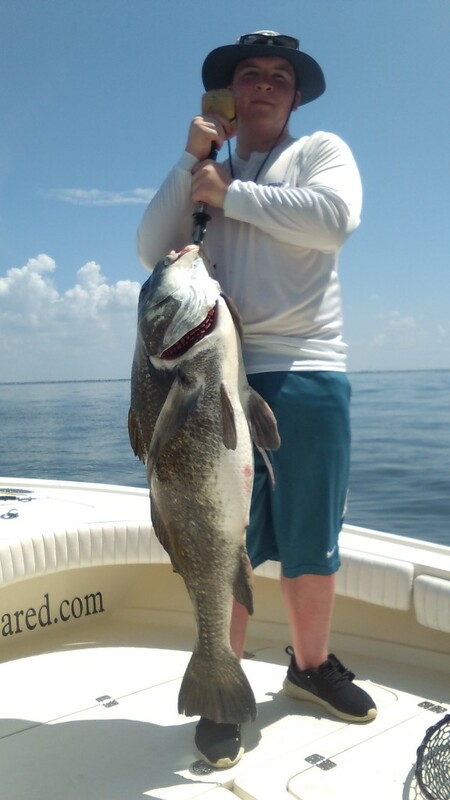 Black Drum are also starting to show up and these fish are BIG! 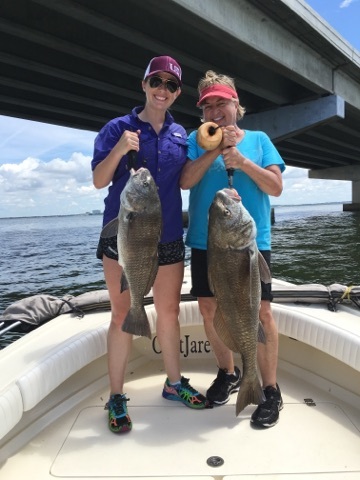 The black drum have been 25-50lbs and have been caught on crabs and artificial jigs fished around the bridge pilings. These fish should remain plentiful throughout the summer months.